Thanks blaustrom, that photo helps. I will be looking at and defending those wires. Sorry it took so long... I've been arguing with a dirt bike clutch this afternoon. I have added some annotations to the photo (I hope they are large enough to read). Probably the first thing to do is remove the airbox and turn on the ignition to see if they are moving. If they are moving, then I would check the feed back voltage. From there I would move to the DTC diagnosis procedures for checking the wiring between the ECM and the throttle body parts. 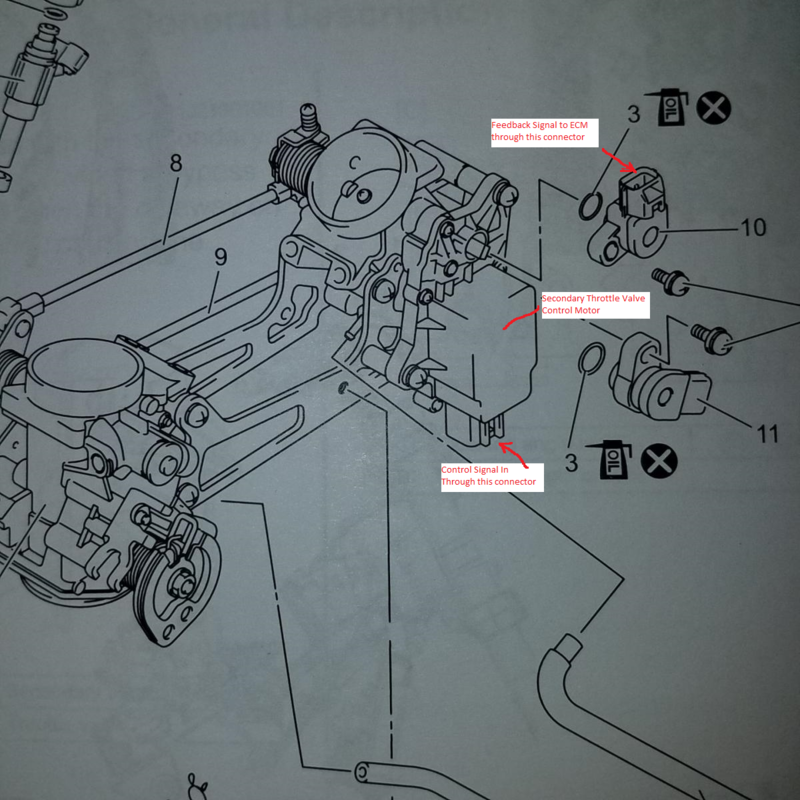 There are several other pages for testing for continuity and shorts in the wires between the ECM connector and the secondary throttle valve motor and sensor. Thanks very helpful. I could read the annotations by dragging the image to my desktop and enlarging. I have it on the lift and the tank off ... I will need to do some more terrestrial things til Tuesday afternoon. But then I'm back at it. Did you fix the clutch switch yet? Yes I did but sadly that was unrelated. This morning I gave up after testing all the things Grimmer was so helpful with. So after a while they decided that they needed a factory guy to conference in on it. Likely no answer til Tuesday. Stay tuned. Just got a call from my dealer - my bike is ready and runs fine. A few posts ago Bad Dad asked if I had fixed the clutch switch. I answered, yes. I took it out and cleaned some mild mung. Reinstalled it and the bike went back to not starting with the clutch lever out. But I didn't replace the switch. And yeah that was the problem. The dealer did all the same tests that Grimmer had suggested and then made a second call to the boys at HQ. They were told to replace the switch anyway just for good measure. Tah Dah ! It seems that the same core ECU (some variants) is used in the Gixers. Same problem. Same fix. I know we tend to bad mouth dealers but I got to say that the guys at Powersports of Vallejo Vallejo, CA (707) 644-3756 hung in there. They did a lot of work and only charged me for the switch replacement. And yes I have ordered a spare switch to live under the seat. It should be added to all the threads about "what spares do you carry". Thanks Greywolf, still helping us. Thanks, good advice. This has been an issue for some, so I added it to my proactive replacement schedule. I was in my local shop and got talking to the head guy about a Kawasaki they were having issues with and I suggested they replace the clutch switch. It fixed the problem they had spent days chasing, it was a lesson for them and made me look like a genius.